Ever wonder what it would be like to run for president? The Political Machine, is the turn-based strategy game that puts the player in the role of a presidential candidate. 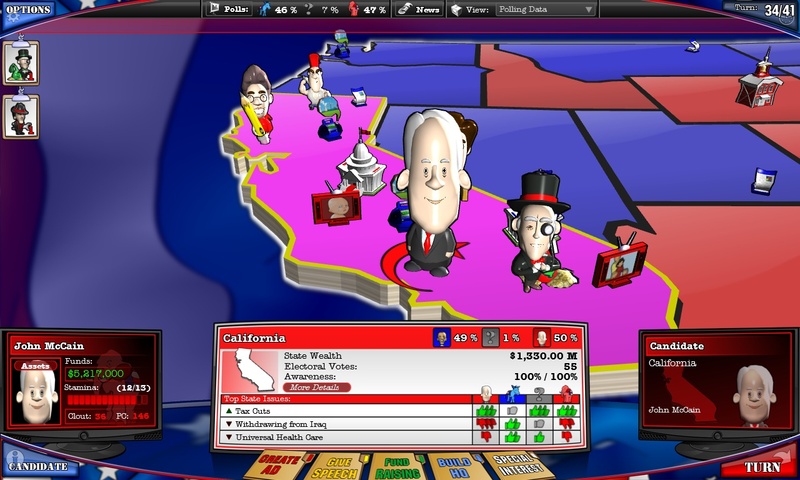 Players can play as real-world candidates such as Barak Obama or John McCain, choose amongst historical candidates, or design their own from scratch. 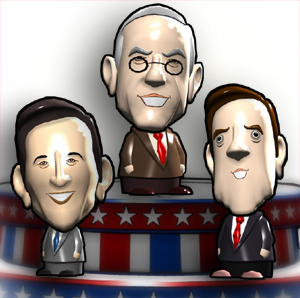 The Political Machine 2008 version 1.04 is now available to all registered owners of the game. This update includes various tweaks, as well as new elements to help you create your own bobble-head. Also, a new enhanced chat feature that allows players to smack-talk opponents in multiplayer during the final votes. Version 1.04 also adds several new 'Dark Horse' candidates, such as the wise-cracking Minister Mike Huckabee, the rock skipping Mike Gravel, and media stud Dennis Kuchinich. To obtain the new patch, just click on the Download Updates button from the main menu, or use our new state-of-the-art digital distribution client, Impulse. If you don’t have The Political Machine, you can pick up a digital copy for $19.95 at http://www.politicalmachine.com or through Impulse. For a boxed copy, visit your local retailer including Target and Best Buy . Link: Want to see more? Check out the new The Political Machine 2008 trailer!